The first comprehensive biography of Weegee—photographer, “psychic,” ultimate New Yorker—from Christopher Bonanos, author of Instant: The Story of Polaroid. Arthur Fellig’s ability to arrive at a crime scene just as the cops did was so uncanny that he renamed himself “Weegee,” claiming that he functioned as a human Ouija board. Weegee documented better than any other photographer the crime, grit, and complex humanity of midcentury New York City. In Flash, we get a portrait not only of the man (both flawed and deeply talented, with generous appetites for publicity, women, and hot pastrami) but also of the fascinating time and place that he occupied. 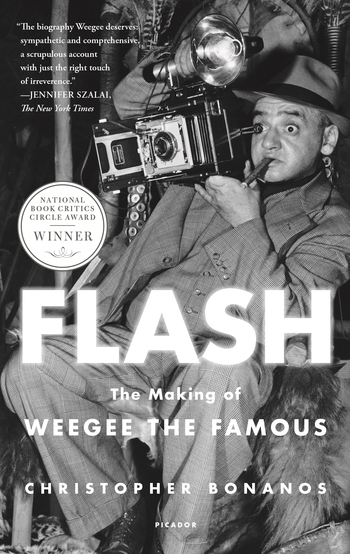 From self-taught immigrant kid to newshound to art-world darling to latter-day caricature—moving from the dangerous streets of New York City to the celebrity culture of Los Angeles and then to Europe for a quixotic late phase of experimental photography and filmmaking—Weegee lived a life just as worthy of documentation as the scenes he captured. With Flash, we have an unprecedented and ultimately moving view of the man now regarded as an innovator and a pioneer, an artist as well as a newsman, whose photographs are among most powerful images of urban existence ever made. Let’s talk about that name first. Or, rather, those three names.